A little over a month ago I was commissioned by a coworker to make a candleholder for him to give his wife for Christmas. After some color discussions (to make it match his dining room table), we settled on lacquered mahogany. I found some 8/4 slabs of mahogany and realized it would be great if I could make the entire thing out of a single slab of wood. 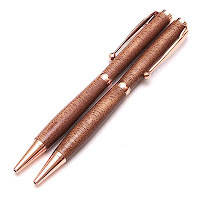 From the scraps I made a pair of endgrain mahogany and copper pens. The base of the candlehoder is solid mahogany. The angled sides were cut on the bandsaw with the table tilted. I drew the oval with a pencil and two nails and a string and cut close to the line, finishing with hand sanding to remove the saw marks. The center I routed out with a straight bit on my handheld PC 690 router. The candlestick holders were turned on the lathe and 5/8" holes drilled to hold the candles. The dishes in the base are epoxied into 7/8" holes. A drum sander added the detail underneath. The candleholder was finished with Deft lacquer while the pens were finished with CA.